Following the terrorist attacks on the United States of 9/11/01, the U.S. Government declared a global war on terror. Simultaneously, there was an urgent need for an explanation for the hatred that triggered these attacks. In an attempt to find such an explanation, researchers, policy-makers, and U.S. government officials turned to international public opinion polls to uncover the general attitudes of populations abroad toward the United States. These descriptive public opinion polls showed a generally negative attitude of Muslim populations abroad toward the United States and the U.S.-led war on terror. As a result, the U.S. Congress began seeking the advice of international experts to determine what can be done to change the detected negative public opinion patterns. While the recommendations made by experts were plentiful, there was no objective mechanism for prioritizing certain recommendations over others. In order to truly determine what needs to be done, researchers need to first understand how the United States and the U.S.-led war on terror are perceived in the minds of Muslim individuals living abroad. Understanding perception, in this context, is different than simply describing one’s opinion about a specific subject matter. The difference between the two is best explained through an analogy using a common American concept. Let’s take for example, the concept: “the fourth of July.” It is useful to find out how Americans feel about the fourth of July and we can do so by quantitatively describing whether they like or dislike this annual holiday. However, in order to truly understand their liking and disliking of this holiday, we need to uncover what the fourth of July conjures up in their minds. In other words, we need to uncover the cognitive building blocks that, altogether, construct the concept “fourth of July” in their minds. Such cognitive building blocks might consist of “fireworks,” “burgers,” “hot dogs,” “family,” “warm weather,” etc. It is the interrelationships among these cognitive components that result in the liking or disliking of the fourth of July. Researchers tend to use the term “schema” to describe the cognitive structure associated with a particular social concept. Similarly, in order to truly understand how Muslim individuals living abroad feel about the “U.S.-led war on terror,” we need to uncover the components of the schema associated with this concept and then detail the interrelationships among these schema components. It is only then that we would truly understand what prompts the variation in Muslim public opinion toward the concept in question, thus allowing us to determine what might create a positive Muslim public opinion toward the U.S.-led war on terror. This book set out to do just that. The unit of analysis in this book was the Muslim citizen living in selected countries with substantial Muslim populations: Lebanon, Egypt, Turkey, Indonesia, Pakistan, Nigeria, and Senegal. The data used in this book were drawn from a large-scale survey of international attitudes undertaken by a major research organization and made available to academic researchers for re-analysis. 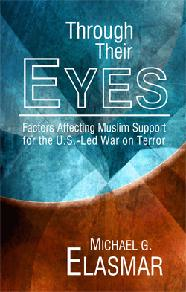 This book applied theory-driven structural equation modeling techniques to a selected portion of the survey data corresponding to the countries listed above to identify a set of factors that account for the variation in individuals’ likelihood to support the U.S.-led war on terror and, by the same token, shed light on the schema present in the minds of Muslims concerning the U.S.-led war on terror. So what did this book conclude with respect to Muslim’s schema pertaining to the U.S.-led war on terror? 2.Negative beliefs about the United States stemming from their interpretation that the process of U.S. foreign policy ignores their interests. It is the negative beliefs that influence their overall feelings toward the United States. Positive and negative beliefs seem to be a function of the respondents’ predispositions. Specifically, the more open they are to other cultures, as suggested by their receptiveness to imported media, the more predisposed they seem to consume U.S. entertainment media, and thus, acquire potentially positive beliefs about the United States. It is notable that Muslims’ belief that the United States ignores their countries’ interests when developing its foreign policies is a critical driver of their opposition for the U.S.-led war on terror. This finding is consistent with elements of Muslims’ collective memories stemming from their own countries’ and perhaps their region’s recent experiences with the West as illustrated in the chronologies presented in each country chapter. The one consistent element that emerged from these chronologies was a historical pattern of Western self-interest when dealing with these countries. Muslims are most probably using this as a heuristic for interpreting U.S. foreign policies. Thus, when processing information about recent U.S. foreign policies, including the U.S.-led war on terror, the heuristic of self-centered Western goals leads Muslims to see these U.S. foreign policies as designed to solely serve the interests of the United States. This heuristic is most likely reinforced through the recurring public declarations by various U.S. government officials that a certain foreign policy being debated will be adopted based primarily on whether it is or is not in the interests of the United States. In order to increase the probability that Muslims will support the U.S.-led war on terror, U.S. policy makers need to increase the occurrence of factors that generate positive beliefs, and decrease the occurrence of factors that generate negative beliefs, about the United States. Consumption of U.S. entertainment media seems to generate positive beliefs about the United States. This is inferred from the fact, that consumption of U.S. entertainment media is a positive predictor of attitudes toward the U.S. Thus, it must be a primary source of positive beliefs about non-political aspects of the United States. As such, it is the only actionable factor that is a source of positive beliefs about the United States in the MIPOs depicted in Chapter 11. This finding might be interpreted as suggesting that, in order to increase the occurrence of factors that generate positive beliefs, the United States should increase the availability of U.S. entertainment media in the seven countries studied and encourage more people in these countries to consume such media. However, U.S. entertainment media is already widely prevalent in these countries via various terrestrial television and radio stations, movie theaters, video and music stores, and through the wide availability of U.S. entertainment packages via pay services (i.e., cable and satellite). The broad availability of U.S. entertainment media is already generating positive beliefs about the United States among those who have chosen to consume such entertainment. So, the U.S. private sector that generates such entertainment media content, together with market supply and demand for such content, in these seven countries are already positively contributing to how the United States is perceived in them. While the availability of such entertainment should not be curtailed, increasing its presence is not likely to make it more influential, especially in those markets where it is already widely available. Instead, the Models of International Public Opinion depicted in Chapter 11 suggest that all efforts should be focused on changing the negative beliefs that compete with the positive ones stemming from U.S. entertainment media. The only actionable source of negative beliefs about the United States in the models depicted in Chapter11 is the perception among Muslims that the United States does not take into account the interests of countries like each of their own when formulating its foreign policies. This perception falls within the realm of the United States public sector, more specifically within the domain of the U.S. Federal Government. Similarly to the model corresponding to each country individually, the overall models depicted in Chapter 11 suggest that the primary objective of any public diplomacy efforts undertaken by the U.S. government should be to change the perception that the U.S. ignores the interests of Muslim countries when formulating its foreign policies since this perception is a primary driver of opposing the U.S.-led war on terror.